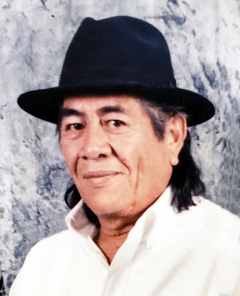 Santiago “Jimmy” Caudillo Sr., 74, passed away Monday, September 10, 2018 in Lubbock. Services for Mr. Caudillo will be 10:00 am Wednesday, September 12, 2018 at Our Lady of Guadalupe Catholic Church in Slaton with Father Angelo Consemino officiating. Burial will follow in Peaceful Gardens Memorial Park under the direction of Broadway Funeral Directors. A rosary will be held 7:00 pm Tuesday, September 11, 2018 in The Chapel of Broadway Funeral Directors. Jimmy was born August 10, 1944 in Lockhart to Marcelino & Refugia Caudillo. He married the late Ricarda Sanchez on November 29, 1967. Many years after the passing of his first wife, Jimmy married the late Maria Rangel. He worked as a Gin Manager for most of his life and was a catholic. He enjoyed watching the Dallas Cowboys and spending time with his family. He is preceded in death by his first wife, Ricarda Caudillo (June 11, 1975); his second wife, Maria Caudillo (December 5, 2003). He is survived by seven sons, Jimmy & Linda Caudillo of Lubbock, Adam & Paula Caudillo of Round Rock, Arthur Caudillo of Lubbock, Robert Sanchez of Lubbock, Florentino Lucio of Lubbock, Israel Lucio of Lubbock, Pablo & Virginia Lucio of Lubbock; five daughters, Michelle Caudillo of Lubbock, Norma & Elias Ayala, Yolanda & Frank DeLeon, Ruth & David Leon all of Midland, Diana Lucio of Lubbock; three brothers, Robert & Amparo Caudillo of Lubbock, Joe Angel & Maria Caudillo of Brownwood, Danny Caudillo of California; two sisters, Dora & Eloy Guajardo of Levelland, Janie & Mike Maldonado of Slaton; 51 grandchildren; numerous great grandchildren.